Before I saw the headlines, someone had emailed me the poster. I wish I could honestly say that I was shocked, but it’s hard to shock me these days. Certainly ‘Shariah4Pakistan’ is not a shocking conference name. We hear this regularly implied if not expressed openly on talk shows. Terming Qaid-e-Azam as a ‘Traitor of Islam’ is stupid, but even that is sadly not surprising as religious extremism has become more and more mainstream. No, the one thing I found interesting about the poster were the names of the self-appointed Sheikhs who are invited to speak. Omar Bakri Mohammed, aka ‘Sheikh Omar’ as he likes to call himself, is a British extremist who helped start the Hizb-ut-Tahrir, which is banned in Pakistan, in the UK. Omar has praised terrorism and has even been convicted of terrorism in absentia by a court in Lebanon. Another speaker is the Londoner student of Omar, Anjem Choudary, a takfiri who condemns moderate religious groups as kufr. In 2008, Anjem declared that the Muslim Council of Britain were ‘selling their souls to the devil’ after they condemned the September 11 and July 7 terrorist attacks. This is the group that is holding a conference in Islamabad. They are, by definition, foreign agents. And according to their own words they plan to declare Qaid-e-Azam as ‘Traitor of Islam’, the Constitution as ‘Kufr’, and they plan to issue a fatwa against Malala Yousafzai for wanting an education. And they plan to do this at Lal Masjid, an obvious scheme to open old wounds in society and incite more violence in our country. They are, by definition, foreign agents who are planning on sowing fitnah in Pakistan. Question is, who gave them their visa? Why are these anti-Pakistan foreign agents being allowed to come into our country and incite hatred and violence? This is more than a mere academic question. Last month, Pakistan Ulema Council (PUC) Chairman Maulana Tahir Mahmood Ashrafi condemned the attack on Malala Yousafzai. “Islam is the only religion which strictly prohibits violence of any sort in the name of religion. Our Prophet Mohammad (peace be upon him) has strictly directed not to harm women, children and elderly and so much so has even directed not to damage trees and crops even during the ‘ghazwat’ that he fought against the infidels. How a person calling himself to be a Muslim can resort to such acts of violence and especially against an innocent minor girl of only 14 years? The perpetrators can not call themselves Muslims and this action of theirs has nothing to do with the teachings and preaching of Islam,” Maulana Tahir Ashrafi said. He also urged the government to take every possible step to save the life of young Malala Yousafzai and at the same time take meaningful measures to promote the true teachings of Islam which preaches love, affection, tolerance, co-existence and abhor violence. Will Maulana Ashrafi be made a fool of by these British Osama wannabes? Will the military stand by silently while foreign agents incite attacks and undermine our national security? Why are none of the self-appointed ‘defenders of Pakistan’ asking who issued these foreign agents their visas? How can we expect America to respect our sovereignty when we allow these militant ‘drones’ to threaten innocent girls? These are not academic questions. They are questions of survival. 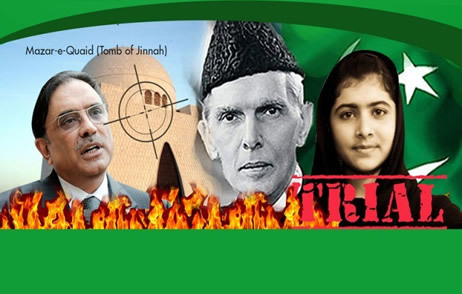 This entry was posted in Blogs and tagged Anjem Choudary, extremism, foreign agents, Hizb-ut-Tahrir, Lal Masjid, Malala Yousufzai, militancy, Omar Bakri, Tahir Ashrafi by Mahmood Adeel. Bookmark the permalink.